– President Ronald Reagan, October 6, 1988. On October 6, 1683, the first organized group of German immigrants arrived on these shores. They purchased land from William Penn, the proprietor of Pennsylvania, and established the village of Germantown. In 1983, President Ronald Reagan established the Presidential Commission for the German-America Tricentennial. Their planning included the garden you see before you. The Deshler-Morris House, also called the Germantown White House, sheltered President George Washington and his family. It still stands today as the oldest surviving presidential residence. their last meeting and the dedication of the garden. 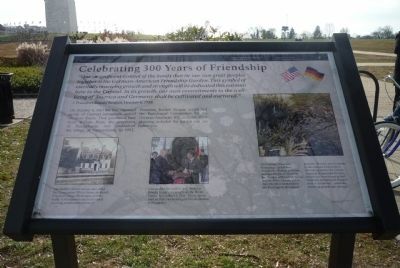 The German-American Friendship Garden was designed by Wolfgang Oehme, strategically placed between the Thomas Jefferson Memorial and the White House, and is the only memorial on the Washington Monument grounds. Benches and fountains to the east and west create a welcoming terrace for visitors. A variety of perennial flowers, shrubs and trees found in both countries demonstrate Reagan’s wish to symbolize “...eternally renewing growth and strength. Location. Marker has been permanently removed. 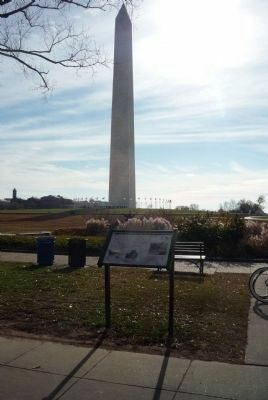 It was located near 38° 53.514′ N, 77° 2.18′ W. Marker was in The National Mall, District of Columbia, in Washington. 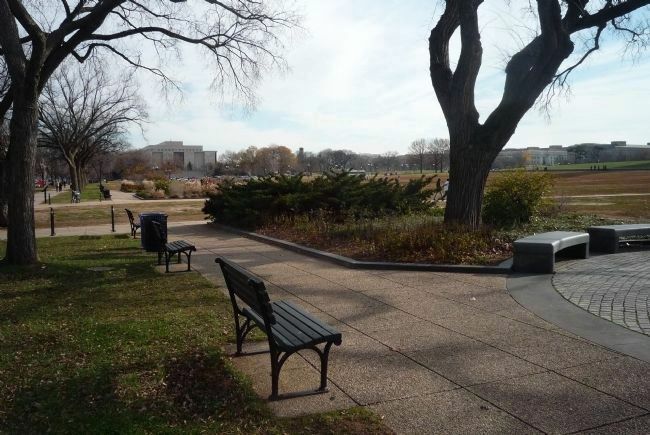 Marker was on Constitution Avenue, NW east of 17th Street, NW, on the right when traveling east. Touch for map. Marker was in this post office area: Washington DC 20006, United States of America. Touch for directions. marker is visible at the edge of the sidewalk off Constitution Avenue, in the background, far left. (about 700 feet away); A Monumental Legacy (about 700 feet away); Bulfinch Gate House (about 700 feet away); Jefferson Pier (approx. 0.2 miles away); Washington City Canal on the Tiber Creek (approx. 0.2 miles away). Touch for a list and map of all markers in The National Mall. Credits. This page was last revised on February 27, 2019. This page originally submitted on December 9, 2010, by Richard E. Miller of Oxon Hill, Maryland. This page has been viewed 1,511 times since then and 14 times this year. Last updated on February 26, 2019, by Devry Becker Jones of Washington, District of Columbia. Photos: 1, 2, 3. submitted on December 9, 2010, by Richard E. Miller of Oxon Hill, Maryland. • Andrew Ruppenstein was the editor who published this page.